Now comes a reminder that a significant part of the USOC’s mandate is outward-facing, too. And here it has a huge mountain to climb, complicated by factors both of its own doing and by those beyond its control — in particular to policy and perceptions attributable to the 45th president of the United States. In the aftermath of last week’s World Youth Weightlifting Championships in Las Vegas, shadowed by visa issues that complicated entry into the United States, USA Weightlifting has announced it is — at least for the near future — out of the bid game for high-level championships. No more big-time weightlifting events in the United States. It’s just too hard to get people in to this country. Or at least, the perception — particularly in many quarters overseas, right or wrong, fair or not — is that it’s too hard. Practically speaking, perception is reality. That’s why USA Weightlifting has, in effect, put the bar down. Andrews is the exceptional national governing board executive who gets it, and totally. Charged with changing the culture and direction of the sport — proving it is possible, particularly in this country, to win Olympic medals without performance-enhancing drugs — he has emerged as a rarity in the Olympic space, a thought leader. His entire message, typically hashtagged, is — it can be done. And, of course, the 2019 youth worlds, in Vegas. Now, though, no more — in essence, USA Weightlifting saying, it cannot be done. This space has said time and again that the 50 national governing bodies are separate entities. The USOC does not run them. This is not an oversight issue in any way, shape or form. In this context, and for emphasis, it is manifestly the case that the USOC had to work with USA Weightlifting, and the U.S. government, to seek to get people in to this country for the Vegas youth worlds. It could not be done. Or, as the Americans were sometimes told, it was too much trouble to try. Sports is the way by which people are supposed to be able to meet each other even when their governments may be having tensions or are in dispute. When athletes or officials from some significant number of countries — even those with whom the United States may be in significant political opposition — can’t get into this country for a youth weightlifting championship, or they’re obstructed in ways that prove meaningful, or they believe they’re going to confront significant obstruction, that’s a big, big problem. And as much as a problem as it might be for USA Weightlifting, it’s a way bigger problem for the USOC, because ultimately — as the Nassar matter has underscored — it’s the USOC that’s ultimately responsible in this country for the Olympic enterprise. Substantively, it’s an issue. Optics-wise, it’s an issue. The breakdown of what happened, and didn’t, in Vegas, and for chunks of this a big thanks to Dan Kent at weightliftinghouse.com for his thorough reporting. The championships ran March 8-15. USA Weightlifting sent information about the visa process to all International Weightlifting Federation nations on July 10, 2018, and then again seven more times. Visa applications were to be in by Dec. 1, 2018, it said — unless your country was affected by Presidential Proclamation 9645, colloquially known as the “travel ban,” in which case applications ought to be in by Sept. 1. In a story posted Monday to the Russian service TASS, the president of the Russian weightlifting federation, Maxim Agapitov, declared it was “impossible” to receive U.S. visas. The important points here are 1. the Russian rhetoric, 2. the letter to Ajan and 3. perceptions internationally of the Americans, fed by this sort of propaganda. Per the IWF, 175 athletes from 42 nations competed in Vegas. In all, including support staff, the tournament counted perhaps 400 people. As for it being “impossible” for the Russians to get American visas — Andrews provided a lengthy statement, apparently first reported by Kent. To begin, Andrews noted, because of sanctions imposed by the United States in 2017, operations at the U.S. Embassy in Moscow have been reduced. Per the State Department, the USOC and USA Weightlifting thus recommended that the Russians apply at a U.S. embassy or consulate elsewhere. On Jan. 14 — late, and well within 90 days of the start of competition — the Russian team said, we will apply for visas. Even though it was late, both USA Weightlifting and the USOC worked to make available workable wait times in third countries, noting that Riga, Latvia, or Minsk, Belarus, had wait times of one to three days. USA Weightlifting further offered to assist with the Russian team’s travel to the interview. This offer was made not once but four times: Feb. 7, Feb. 13, Feb. 18 and Feb. 20. During the IWF executive board meeting in Vegas, the Russian federation claimed they had attempted to obtain visas in Tbilisi, Georgia because there was a camp there. A discussion with the Georgian federation revealed this conversation took place during the 2018 world championships in Ashgabat, Turkmenistan. Ten members applied on Feb. 6 at the U.S. Embassy in Tashkent. Three required “administrative processing” — in lay terms, further examination — and seven were initially declined under Section 214(b) of the United States Immigration and Nationality Act. That section presumes you’re going to stay for good in the United States; it’s up to you, the visa applicant, to provide evidence establishing strong ties to your home country. Ultimately, including those in a supplementary application, there were 12 Uzbekis in Vegas. To reiterate, the recommendation was to apply for a U.S. visa six months ahead of the March championships. The Syrians applied “very late for their visas.” A precise date was not detailed. They nonetheless got them. On the last day of the meet, super-heavyweight Ahmad Alali won bronze. 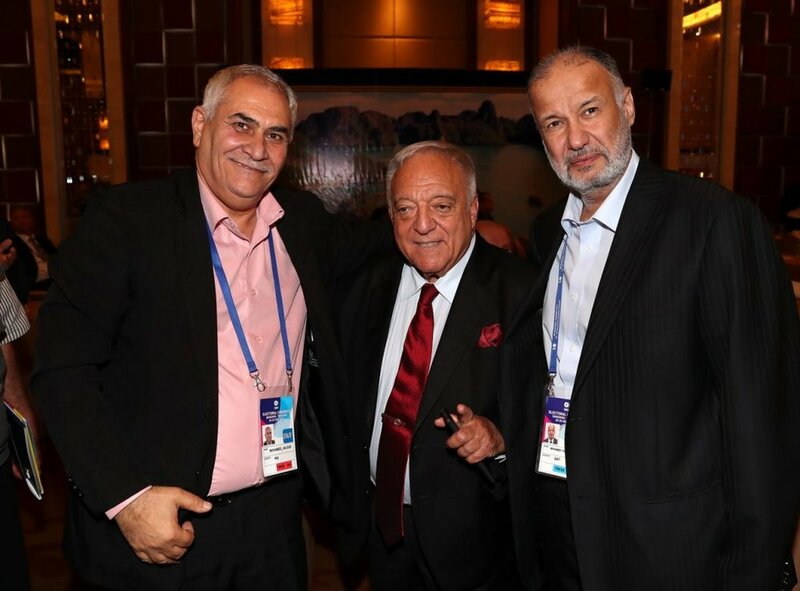 Jaloud, an Iraqi national who lives in Doha, Qatar, is the IWF secretary general. That “processing” meant he missed the IWF committee meetings but arrived in time for the executive board meetings. In that TASS story, Agapitov said these two teams also did not come to Vegas for visa reasons. No preliminary entry was received from Belarus. The president of the Belarus weightlifting federation did apply (on Jan. 21), and receive, a visa to attend the congress held in conjunction with the youth championships. Same basic story for a delegate from Ukraine — applied for and received a visa for, and took part in, the congress. Eleven were registered from Ukraine. None showed up. But this had nothing to do with the Americans, the Ukrainians saying they simply didn’t have enough money — “lack of timely funding” — to send a team of 11 to Vegas. Agapitov complained that the Chinese were on the no-show list. But not because of the Americans. The Chinese did not apply for visas. It’s unclear why. Iran is one of the countries listed under the travel ban. As Andrews noted, that necessarily makes the visa process more challenging. But as the case of the Syrians proved, not impossible. In November, Andrews said, the Iranians let it be known that they would be willing to go through the U.S. visa system for a senior world championship but not a youth championship. North Korea is also one of the countries listed under the travel ban. Its athletes, like those from Iran, are often significant medal contenders at an Olympics. North Korean lifters took part at the 2015 worlds in Houston, which were a qualifier for the 2016 Rio Games; North Koreans did not take part in the 2017 worlds in Anaheim. Despite Agapitov’s mention in that TASS story — the North Koreans also on the list of nations that did not appear in Vegas — they did not apply for visas nor contact USA Weightlifting.